Its Back! 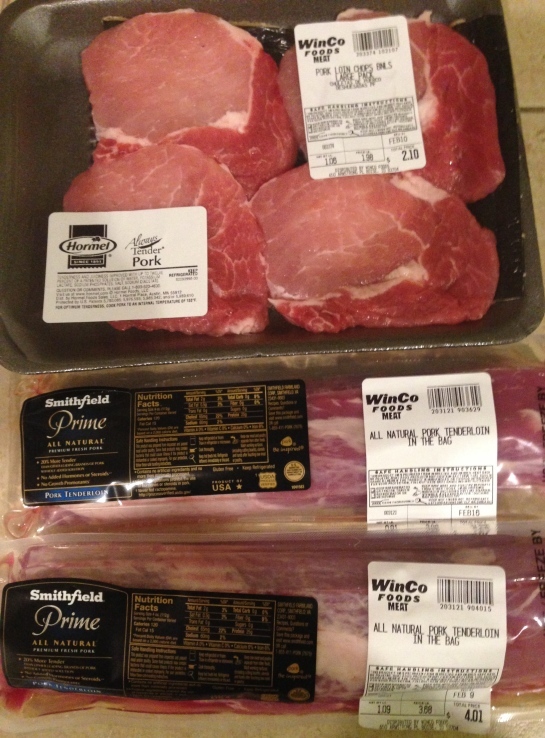 (ish) More Cheap/Super cheap Pork at Winco!! People who don’t coupon say you can never get great deals on meat and veggies. Well today we get a Fantastic deal on meat. So the $1.50/1 Coupon can be used on any pork steak or chop item. I bought the cheap item above for a Super low OOP!=$0.60 for 1.04lb! And there are many Smithfield items, some tenderloin roasts and half roasts. I found the above in the Organic section, for these Prime tenderloins. It basically came to $7.64-$5/2 Coupon=$2.62 for 2 lbs of Tenderloin. Doesn’t get much cheaper than that. Really. 🙂 So print away, and use at Winco! I would print these coupons soon than later,as they will probably disappear fairly quickly! $1.50 off any fresh pork steaks and pork chops! Brought to you by Kansas Pork Farmers. ill call them on Monday. These silly companies. The coupon doesnt say kansas only though so you should be okay to use it. I don’t think it matters if the coupon itself doesn’t say only for use in Kansas… I mean sure that makes it “ok” by the coupon rules, but the outcome in the long run won’t be in your(or any couponer’s) favor. The store may not get reimbursed. Then they’re out the money and more likely to come up with more rules limiting coupons especially ones printed at home. Or maybe the Kansas pork famers do reimburse the stores, then they’re out the money they weren’t planning on and they don’t put coupons out anymore or they complain to other farmers or a pork famer message board or blog where now everyone knows not to put out coupons like that one… or maybe they have to raise prices as a result. I’m just saying that knowingly taking advantage of a coupon that says “offer only valid in Kansas” when you go to print it (even if not actually on the coupon) isn’t a good idea. So i talked to them today. They/she was SOOOO happy we found their coupon. she was more than glad for me to take their coupon, especially since she acknowledged that the coupons does not have the limitation of KS only. BUt im afraid to say she was VERY naive to the fact that too many people will use this coupon. she was sayin that it would be a DREAM if 10000 people used this coupon. lol. My guess is 250000 will use it, and THEN it will be a problem. she doubted that fact that that many would use it. so i am going to pull the coupon above for that fact. You might want to delete the link on your main page too.